ClickZ is a great learning resource. Even for expert readers their articles are well researched and informative – they simulate thought and further discussion. So when asked by Linus Gregoriadis, Global Director of Research & Intelligence at contentive (publishers of ClickZ), to discuss my thoughts on the latest digital marketing trends, I was of course flattered. 1) What do you see as the key trends impacting the world of digital measurement and analytics in 2016? The last two years has been all about re-marketing. Everyone and their dog appears to have jumped on the bandwagon and I must admit there are compelling reasons – it works! That is, visitors who previously bailed out of your shopping cart will return later and purchase after seeing your ad “re-displayed” to them elsewhere. My skepticism of this technique – namely the reliance on third-party cookies which I thought users would block by default – has not materialised. Interview conducted by Rene Nijhuis of iProspect for their recent GA Premium Event. 2) Are there any particular developments that will make it more challenging for marketers and analysts to derive insights from data? The challenge in our industry remains people. That is, finding suitably qualified and experienced people who can keep on top of data quality (so that it can be trusted by the organisation), and used in a scientific way (i.e. go beyond basic visitor numbers by building and testing a hypothesis of what is actually happening on your site). This challenge has been around forever. People who can do analytics well are rare and unfortunately I do not see it being addressed in the near future. If you find a good analyst – keep them and nurture them. I would say the most important part of an analyst’s job is working in an environment of continuous learning – not their salary. That is, create a place where investigation, learning and knowledge transfer are key aspects of their day-to day work. I find that is equally important regardless of job seniority. 3) What are the developments that will make it easier to derive insights and enhance business value? Data-driven attribution modelling (DDAM) has the potential to be very insightful. That is, instead of you having to choose a model for your attribution (“all models are wrong, its just that some models are less wrong than others!“), algorithmic modelling techniques are used to automatically apply weights to your different marketing channels for you. i.e. the machines do the work and in theory remove the large element of educated guesswork normally required with attribution modelling. Sounds great, right? In theory yes. However just as it is silly to say: “If you employ enough trained monkeys eventually they will produce the entire works of Shakespeare“, it is folly to think that DDAM is a panacea for marketers. Smart people (analysts) are still required in order to point the DDAM ship in the right direction i.e. provide setup and adjustment. For example, a global brand versus a niche brand will produce almost identical data points for attribution. However, the correct models are very different for each business. A global brand’s digital marketing is hugely influenced by their massive spend in non-digital channels e.g. TV. The “direct” channel will therefore be overstated by DDAM because it cannot take into account what is happening for the brand via TV, print, billboard etc. Only a human with a strong understanding of the business can recognise and adjust for this. I enjoy metaphors and analogies – I use one at the start of each book chapter. This one also works well for DDAM. 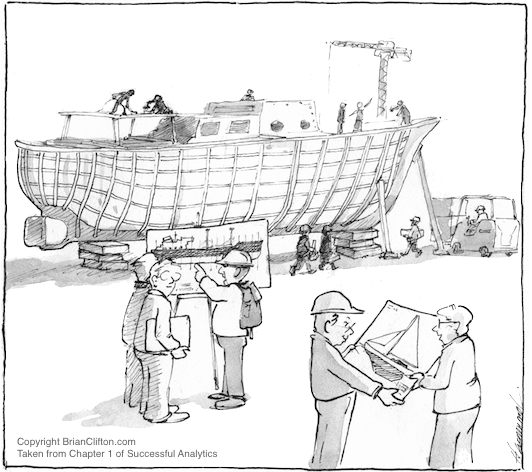 Building a ship (the DDAM mthod) is one thing, but sailing in the right direction and keeping it on course is just as important (the analysts)! 4) Are there any obvious winners or losers as the digital analytics and optimisation markets continue to mature and evolve? I think optimisation products e.g. test and experiment tools, still have a long way to go to reach maturity. They are certainly not as far ahead as analytics tools. Those two industries are still quite separate at present, though ultimately they will merge into one. Optimisation is all about data – it simply doesn’t make sense for users of these to have separate data sets and separate controls. I expect more consolidation to happen in 2016 i.e. mergers and acquisitions.